At the beginning I want to say: Hello everyone! I always wanted to give a try with pixel art. Finally I did it and here are first results. The first one ever made is toadstool. I know it's far aways from being successful but it was just first step (to check if it's someting for me). The 2nd one is this nasty bug which was invented by myself. For this one I still want to spend some time to improve it (colors, curves correction, adding AA, shadow shape on the body etc). I'm not an artist and I'm not even good at drawing. I know anatomy isn't best here (like some other things) but the only question I have at this stage is about shading. Is it fine? What would you guys change/add/remove here? I don't like this bottom and I feel I can make it more interesting. I would recommend finding a pallete to play with to understand colors better, right now the colors aren't at peace with one another. The browns and greys and beiges clash on the worm. this forum right here is a good read, although it can get a little intimidating. 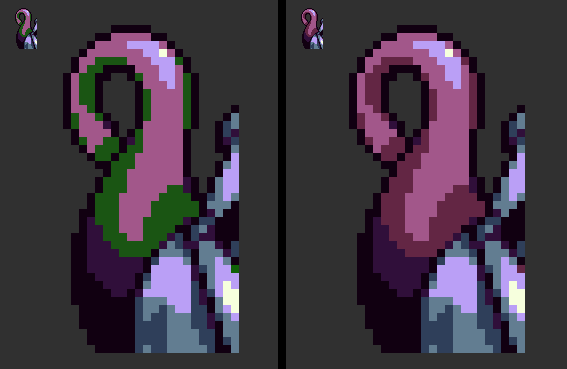 ...and in this image, eyeburn is created by the green clashing with the purple. The hue should logically follow its neighbors in the ramp.